The area of Pasabag in Cappadocia is famous for its perfect fairy chimneys, sculpted from ancient lava, ash, and basalt. They jut up all over the place, even in the middle of a vineyard, hence its name which translates as Pacha’s Vineyard. Pasabag is famous for its opportunities to hike among the boulders and into the hills that ring the area. If you just want to relax, in the small village by the road there are stalls serving hot spiced wine in winter, and freshly-squeezed juices in summer. There are also a few cafes where you can grab a bite to eat, and stores selling Cappadocia textiles and artwork. Also known as Monk’s Valley, Pasabag was once home to hermetic monks who sheltered in the smaller cones atop the upper sections of the fairy chimneys. There was once a Simeon monks’ hermitage here too, and today you can still see the chapel dedicated to Saint Simeon who, fed up with all the attention he was getting in 5th century Aleppo when word got around that he could perform miracles, hightailed it to the top of the highest fairy chimney he could find, and only descended in order to receive food and drink from his disciples. On the road to Zelve from Goreme, parking and entrance at Pasabag (Monks’ Valley) is free. Experience Turkey with one top the TOP RATED agencies on TripAdvisor. Book your 4 Days Turkey tour package to experience the unique opportunity to visit all major destinations after Istanbul. This tour includes Cappadocia, Ephesus and Pamukkale. You only travel by plane for maximum time saving and minimum hassle as well as tiredness to enjoy every part of your program. Starting the trip with Cappadocia, famous with its distinctive “fairy chimneys,” tall, cone-shaped rock formations. Moving further with Ephesus, an ancient Greek city on the coast of Ionia. Finally ending in Pamukkale, in other words "Cotton Castle", is a hot spring with calcium-coated cliffs and pools in inland. Cover the most stunning, in-the-know locations in the otherworldly region of Cappadocia during this comprehensive overnight trip, with domestic flights from Istanbul. Settle back and marvel at history-filled lunar landscapes during a scenic, sunrise hot air balloon flight, and admire hand-painted frescos in the region’s iconic rock-cut churches. You’ll also enjoy savory Turkish specialties in local restaurants and sleep soundly in a comfortable boutique hotel. The package covers the one hour hot air balloon tour and full-day Cappadoca Red tour which will stop at Devrent Valley, Pasabagi (Monk’s Valley), Avanos, Goreme Open Air Museum , CavuSin Village, UChisar Castle. Short and sweet, this tour is perfect for those with limited time. See the best places of Turkey, the iconic sites of Ephesus, Pamukkale and Cappadocia. We guarantee you will be amazed at the rich history and the diverse landscapes to be found here. Located in central Turkey, Cappadocia is one of the country’s top attractions. Discover the stunning region’s major highlights—and enjoy a seamless traveling experience—on this round-trip, 2-day tour from Istanbul. Depart early in the morning directly from your Istanbul hotel and take a short flight to central Turkey. Upon arrival in Cappadocia, you’ll visit the Göreme Open-Air Museum, the Kaymakli Underground City, Pasabag, and can even upgrade to go on a hot-air balloon ride. Transit (including flights), accommodation, meals, and tours are all included. Want to take in the highlights of Cappadocia in just one day? Maximise your time with a full-day small-group tour, including lunch, and cherry-pick the most popular attractions. Start with a visit to the UNESCO-listed Goreme Open Air Museum, then visit the ancient cave village of Cavusin and Pasabag (Monks Valley), home to some of the most photogenic fairy chimneys. Enjoy a traditional pottery demonstration in Avanos, then venture below ground for a tour of the Kaymakli Underground City. Finish your day admiring the view from Uchisar Castle, Cappadocia’s highest point. Take flight from Istanbul to see the best of Turkey by air, on this private, 4-day, 3-night all-inclusive sightseeing tour of Cappadocia and the North Aegean provinces. Discover what life was like for the Turks under Roman rule as you visit ancient cities like Ephesus and Hierapolis, and see travertine rock terraces at the Pamukkale archeological site. See more of Turkey’s natural and historic highlights. 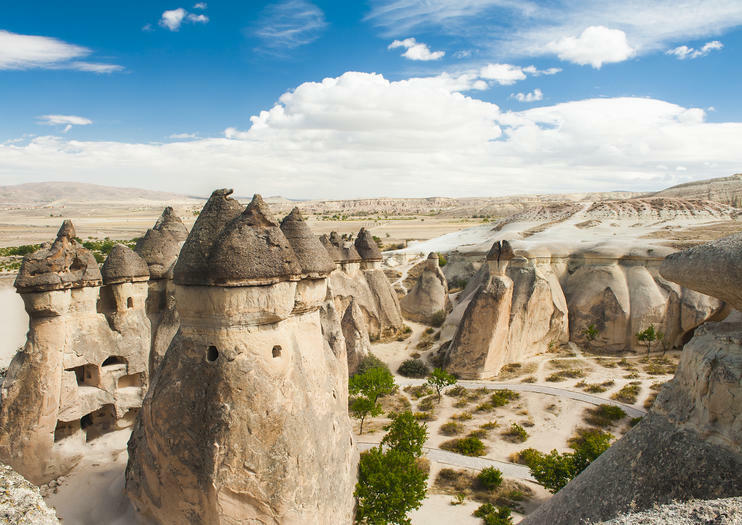 Get an in-depth exploration of Cappadocia and skip the lines on this 2-day tour. Transfer from your Istanbul hotel to the airport and fly to Cappadocia, where a driver will pick you up. Visit Devrent Valley, Pasabag, Avanos, the Goreme Open Air Museum, the Kaymakli Underground City, the Rose Valley, and more. Wake up early for a scenic hot air balloon ride over Cappadocia’s wild landscape. If you would like discover the Cappadocia's valleys, underground cities and fairy chimneys by land and air, this deal package is one of the best options for you. The package is covering the one hour hot air balloon tour, Cappadocia Red tour and Cappadoca Green tour. Explore Cappadocia over three days with an all-inclusive tour from Kayseri or Nevsehir airport. Includes two nights of accommodation at Cave Suites Hotel, and visits to historic sites such as Derinkuyu Underground City, Uchisar Castle, and Goreme Open-Air Museum—a UNESCO World Heritage Site. Have the option to upgrade for a deluxe pre-sunrise hot air balloon flight. 3 Days Cappadocia trip with two nights accommodation in Cave Hotel and round trip flight between Istanbul and Cappadocia. Along with a professional tour guide with, you will visit historic sites in Cappadocia such as Red and Rose Valley, Esentepe, Great Pigeon Valley, Avanos, Derinkuyu Underground City, Dervent Valley, Pasabag, the Goreme Open-Air Museum and Uchisar Rock Castle and more. Also including transportation and museums fees. And optional: Cappadocia sunrise hot air balloon tour. The deal package covers the main attractions of the North and South Cappadocia. You will explore the most famous valleys (Devrent and Pasabag),visit Göreme open-air museum, Çavuşin village, Avanos and Uçhisar castle, Derinkuyu underground city, the deepest one in Cappadocia and allows you to admire the beauty of the less often visited places in Cappadocia like the beautiful Ihlara valley and the Selime Monastery, the biggest rock-cut monastery of Cappadocia with a cathedral sized church. This customizable private tour is the best option for travelers who has just one full day in Cappadocia and want to explore destinations as many as possible. Explore highlights of red and green tours of Cappadocia on your private tour with your private professional licensed guide. This tour also has fully customizable and flexible itinerary. This tour will alllow you to feel like a local, eat like a local, wandering like a local, shopping like a local. You will have chance to taste local made Turkish foods in a boutique way. We guarantee %100 customer satisfaction. Skip the long lines at Goreme Open Air Museum and explore the north of Cappadocia on this full-day tour. Depart from your hotel in an air-conditioned minivan and set out into Cappadocia. Accompanied by a guide, visit Pasabag, Cavusin, Avanos, Urgup, Devrent Valley, and more. Enjoy a midday break for lunch. Maximize your limited time in Cappadocia on a full-day tour. You skip the stress of car rental and navigation with included transportation that takes you from your hotel to the area’s top sights. Visit the Göreme Open Air Museum, Rose Valley, and much more, while your guide narrates. Enjoy free time to explore and take photos at each location. Your comprehensive tour also includes a complimentary buffet lunch in between sightseeing. The Best of Turkey is a small group tour that includes accommodation, domestic flights, an expert guide, meals, transport and more. Visit Turkey's famous 7 UNESCO World Heritage sites, from stunning natural landscapes to remarkable ancient ruins on this tour. Enhance your experience of Turkey’s natural and historical highlights on 10 day Turkey tour of the fascinating country. Alongside a knowledgeable private guide, visit the glory of Istanbul, ancient Troy, Pergamon, Ephesus, Pamukkale and the ancient city of Hierapolis, Mevlana and Whirling Dervishes Museum of Konya, fairy chimneys of Cappadocia. Visiting Cappadocia from Istanbul is well worth the effort, and this 2-day tour provides a stress-free way to make the most of your time. Your local guide shares top attractions including the Göreme Open Air Museum and an Underground City, and you have the option to include a sunrise hot air balloon flight. All the logistics are handled, including round-trip flights, accommodations, entrance fees, and hotel transfers. Explore some of Turkey’s incredible sights on a four-day tour of Cappadocia, Pamukkale, and Ephesus from Istanbul. Leave all of the logistics, including air travel, hotel accommodation, transportation, and many meals to your guides and relax as you take in the sights, history, and culture. Trek through the Rose Valley, ride in a hot air balloon (optional), see the Temple of Artemis — one of the Seven Ancient Wonders of the world — and enjoy traditional Turkish cuisine during your adventure. Visit Cappadocia’s Goreme Open-air museum, see the Pasabag Fairy Chimneys, and many other sights. Get tan in depth look at Turkey on this comprehensive tour. Kick off your trip to Cappadocia with a full-day small-group sightseeing tour, following the classic ‘Red’ route. An ideal introduction for first-time visitors, you’ll tour the Göreme Open Air Museum, Uchisar Castle and Cavusin Village, take a walk around the fairy chimneys of Love Valley, Devrent Valley and Pasabag, and enjoy lunch in Avanos, famed for its red-clay pottery. Cappadocia Red Tour takes you to the highlights of Cappadocia. Especially for travellers with limited time, Cappadocia Red Tour is one of the most popular tour in Cappadocia. Discover the best of Cappadocia on a full-day tour that takes in highlights including the Devrent Valley, Pasabag, Avanos, and Goreme Open Air Museum — a UNESCO World Heritage Site. See otherworldly fairy chimneys and the rock-cut churches of Goreme as you delve into the treasures of one of Turkey's more famous regions. Includes lunch, entrance fees, and hotel pickup and drop-off. You will explore the most famous valleys (Devrent and Pasabag),visit Göreme open-air museum, Çavuşin village, Avanos and Uçhisar castle, Derinkuyu underground city, the deepest one in Cappadocia and allows you to admire the beauty of the less often visited places in Cappadocia like the beautiful Ihlara valley and the Selime Monastery, the biggest rock-cut monastery of Cappadocia with a cathedral sized church.